Kranich’s Jewelers has been serving Central Pennsylvania for Over a Century. Kranich’s is proud to have a location in Johnstown, Cambria County, Pennsylvania. Kranich’s Johnstown location is in the Galleria Mall at Richland Township. 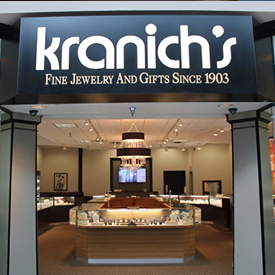 Kranich’s specializes in the sale and service of Fine Jewelry and Watches. Kranich’s features many top designer jewelry makers as well as a tremendous selection of estate and diamond jewelry. Kranich’s is the leading seller of Diamond Engagement rings and Wedding Bands in the region. Kranich’s also features some of the world’s finest timepieces. Kranich’s believe in giving back to the communities we serve. The Kranich family has been active in supporting philanthropies that benefit our region. In addition to Johnstown, Ebensburg and other parts of Cambria County, much of our Johnstown clientele visit us from Bedford, Somerset, Indiana, Clearfield and Westmoreland Counties.